Many women can tell you stories about their hair – about the disastrous haircut or the misjudged perm, about the joy of finding a hairdresser who cuts it just right and the lengths we’ll go to stick with her or him, about the thin line between loving how you look and another bad hair day, about how a bit of rain can turn your sleek curls into unmanageable frizz. I have all those stories and more. However much we might want to be free from the tyranny of the norms of feminine appearance, what we look like does matter and hair is a huge factor in looking good. It took me ages to appreciate that I had curly hair. 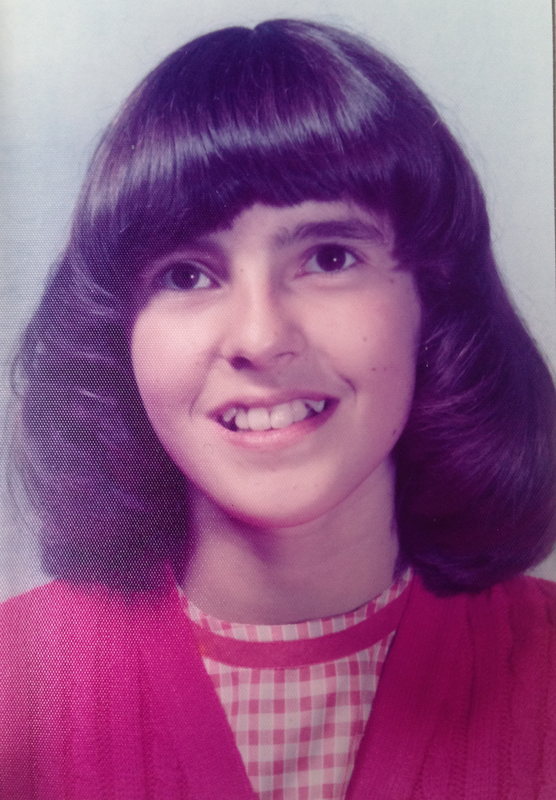 As a child I had it cut in a pageboy, and as a teenager I spent hours trying to flatten my hair to my head. I could have had an 80s ‘shaggy perm’ style without the bother of perming it, but I spent an inordinate amount of time trying to get my hair to ‘flick’ at the sides instead. I used clips to try and get it under control, would position my hair very carefully when I placed it on the pillow at night, and even went through a phase of wearing a bobble hat as it dried in a vain attempt to achieve the smooth and silky look I craved. My teenage self hated my hair. A new hairdresser in my student town showed me what it could do and, apart from two pregnancies and a brief dabble with hair straighteners when I was 40, I’ve worn it curly ever since. It’s been long, short and in between and while I’ve recently been debating with myself how long I can get away with home-dying it to cover the grey, and I’m still searching for that elusive product that eliminates frizz and produces perfect curls, I’ve grown to love my hair. And I’ve been quite upset at the thought of losing it. The ‘cold cap’ won’t work for the type of chemo I’ve having and, besides, I hate being cold so hours with an ice-pack on my head is too much pain for little gain. I went to see my hairdresser a couple of weeks ago to get her to cut it short in preparation, but when I tried to explain what I wanted I burst into tears. She gave me a big hug and refused to cut it short, but she did give me a great haircut which I have loved for the last two weeks. Today, as I was washing my hair in the shower, it started to fall out, covering my hands and clogging up the plug hole. I was feeling elated after running five miles this morning so wasn’t that bothered – proof once again that running makes everything better – but perhaps it’s more that I’ve become resigned to losing it. There’s still a lot of it to go, but baldness beckons. Btw allowing myself to go grey was a big step for me, not as profoundly challenging as for you …. But it was a step for womankind in its own way! I’ve been meaning to email you since Shane sent me your last blog last week. (I hope you don’t mind!) I’ve really valued the opportunity to read your posts – having had chemo a couple of years ago, there’s something very confirming about hearing similar experiences and feelings from you – that I didn’t ‘imagine’ it – it’s very validating, so thank you for sharing what you’re going through. I found that once I had finished the treatment, I then needed to process what had happened – something my friends and family had the time to do while I was going through it all, and I find I’m still doing that to some extent. I lost my hair too. Well, as it started falling out, I decided to shave it off – so one evening, while I cried, Shane shaved my head. I had bought a wig and a lot of scarves – the wig I never wore (too itchy), the scarves I did wear for a few weeks, then I met a woman who was going ‘naked’, and, inspired in some strange way, I stopped using the scarves as well. It is a hard one. What I did enjoy was not having to wash my hair and style it every day – so low maintenance! Thank you Wendy – really great to hear from you and it’s so helpful to learn from people who have done all this before me. I’m thinking I might need to get my head shaved soon. My hairdresser said she would do it for me for free but I think that would be too emotional – maybe I need somewhere no one knows me! I haven’t decided what I’ll do with my baldness, but a wig doesn’t really appeal at the moment. We’ll see! Thank you Anita – it’s amazing how many people have been through similar experiences – I never knew that about you!